Welcome to The ATX House! The ATX House is totally updated and furnished with everything you will need for a great stay in Austin. It is located just 2 blocks from Barton Springs and the Hike and Bike Trail and 2 miles to downtown. 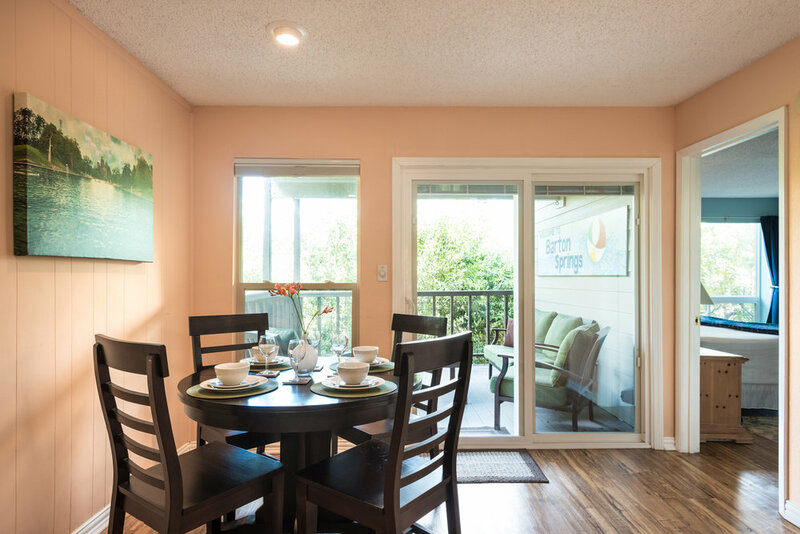 This cozy condo is thoughtfully decorated with custom 'Austin' photography and art and features a super comfy covered patio surrounded by greenery. The bedroom features a King bed and a large floor to ceiling window. There is also a pull out full-size sofa bed in the living room if you need more sleeping space. The kitchen is well furnished with everything you need to cook. Along with plenty of dishes, pots and pans, We also provide organic local coffee beans, grinder, sugar, slenda, half & half, and an assortment of teas. There are basic oils, spices and even a britta filter pitcher. There is a GRILL JUST OUTSIDE THE FrONT DOOR FOR YOUR USE and grill utensils in the kitchen. In the bathroom we supply shampoo, conditioner, body wash and lotion (whole foods brand) as well as make-up wipes. There are 4 sets of towels, including beach towels to take to Barton Springs. Should you need to, There is a free laundry room just downstairs. Additional linens available upon request. Other amenities include: free reserved parking, wifi, cable tv, coded dead bolt, and a welcome book with city and trail maps and local information. The ATX House is part of the ZilkerVacations family of vacation rental homes and condos in the Zilker Park area. We do everything we can to assure you the most comfortable stay possible. We live in the zilker NEIGHBOURHOOD and have for many years so we are thrilled to have you enjoy it too. $60 cleaning fee and 15% hotel tax applies to all rentals that are less than 30 days unless you are active military or have some other tax exempt status.